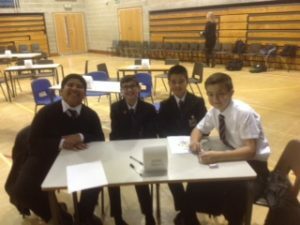 Eight boys from MTBS and four girls from MTGS, in Year 7 & 8, enjoyed taking part in the Kids’ Lit Quiz on Friday 9th November. This year, the Quiz was hosted by Merchant Taylors’ Girls’ School, where 19 teams from schools across Merseyside took part. The Boys’ School teams were: Ahmed Bashier, Joseph Bigley, Adam Blagbrough, William Cunliffe, Drew Hutchinson, Zac Richardson, Liam-James Sewards, Raiden Swindells Although the Boys’ teams, did not get through to the national final, they did well in the rounds on saints, realms and Shakespeare. Wayne Mills, the question master from New Zealand, made the afternoon speed by with ten rounds of questions on all aspects of children’s books, giving book prizes for each round and cash prizes for extra questions. The Girls’ team was Mary Nicols, Neave McCormick,Camilla-Jane Dean and Lily Bland. The MTGS team came a very creditable 6th, considering one member was co-opted at twenty minutes notice, to cover for an absent team member. Our own history teacher, Mrs Grindley, won an audience spot prize by recognising the opening lines of The Snow Goose by Paul Gallico! The winner this year was Wirral Grammar School for Girls, who will take part in the national final in London. National winners go to Singapore in 2019 to compete in the world final. Well done to all those involved!